This Bark River Golok model features a satin finished A2 steel blade paired with a Green Camo G-10 handle. The Bark River Golok is rooted in the traditional tools of the Indonesian region. This type of tool has been used for centuries and has proven to be one of the most useful for Bushcraft. 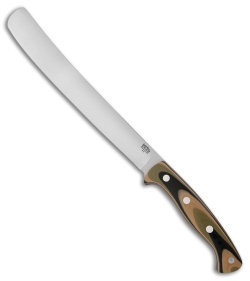 The Golok is light, compact and is easy to carry for such a large knife. It excels at trail clearing, chopping, shelter building, notching and splitting firewood.